British Artefacts Vol 3 - Late Saxon, Late Viking & Norman by Brett Hammond. In this significant book, Brett Hammond builds on the success of the previous volumes, illustrating the social, military, economic and religious developments in the Late Saxon, Late Viking and Normanperiods with well‐chosen artefacts of many types photographed to bring out their beauty and charm. The author is a respected researcher in the field of Anglo‐Saxon and Viking material culture, with more than a decade at the forefront of object identification and classification. His fascination with and passion for the subject comes through on every page. British Artefacts is a new series of books covering finds made in the British Isles and their contexts, drawing on parallel Continental examples. The objects described and illustrated (in photographs and line‐drawings) will represent the range of items in use, from the lowly pin or knife blade to the finest quality jewellery. Volume 3 covers Late Saxon, Late Viking and Norman finds from circe 950-1150AD, comprehensively encompassing Mammen style, Winchester style, Ringerike style, Romanesque style and Urnes stule, with succinct one-line summaries telling you what to look for when seeking the characteristics of those art styles on your findds. No matter what a day's searching puts into your finds bag - plate brooches, zoomorphic brooches, penannualr brooches, annular brooches, buckles, belt fittings, strap ends, fasteners, tags, pins, pendants, rings, arm-rings, bracelets, swords, axes, spears, knives, daggers, scabbard fittings, maces, helmets, armour, stirrup mounts, stirrups, spurs, gaming pieces, weights, seal matrices or lead seals - you will find much about them in the pages of this remarkable book. Packed with images of metallic and non-metallic finds, superb maps, a comprehensive survey of manufacturing techniques, a potted history of these turbulent centuries, the glossary and the extensive bibliography, all of which add value to British Artefacts Volume 3 and demonstrate what a truly magnificent book this is. British Artefacts Vol 2 - Middle Saxon & Viking by Brett Hammond. The first volume in the series dealt with the early material from the Adventus Saxonum through to the middle of the 7th century when the process of conversion to Christianity was underway. This second volume covers the Middle Saxon material, including the impact that the Vikings had on Anglo-Saxon life during the period of the Great Army, the resistance of King Alfred, the Danelaw and its reconquest by Edward the Elder, the Kingdom of York and the formation of England under King Athelstan. All lavishly illustrated with nearly 400 beautiful colour pictures and maps. The book is laid out logically with preliminary discussions of the history, and of manufacturing and distribution as well as advice for collectors and finders; there follows a brief outline of the scripts, Roman and runic, Anglo-Saxon and Scandinavian. The art styles are discussed in some detail, then follow the metal artefacts by type, followed by the non-metallic material such as glass, amber, bone and horn. The burial traditions – inhumation and cremation, Viking and Anglo-Saxon – are handled succinctly in a few pages with typical grave plans. Scandinavian settlement is dealt with as well as the Middle Saxon and Viking kingdoms. Finally the summary data for the images are tabulated, followed by a glossary, bibliography and index. The book covers the subject brilliantly, offers a great breadth of material and manages to spring a few surprises – it includes a unique gold finger ring bearing the name Cynefrid, a gilded Irish mount and some spectacular swords. 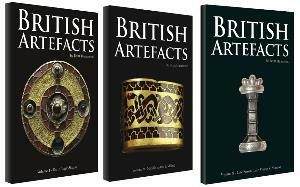 British Artefacts Vol 1 - Early Anglo-Saxon by Brett Hammond. The early Anglo-Saxon period is of immense importance to the later history of Britain. It saw the changeover from British-speaking provinces dominated by Roman power and culture to English-speaking kingdoms interacting within a European network of kings, nobles and chiefs. The two centuries from AD 400 onwards in lowland Britain were witness to huge changes in social structure, settlement pattern, political ideology, language and religion. In this important new book, Brett Hammond has drawn together images, distribution maps and descriptions of some important pieces of jewellery, wargear and feasting equipment from the period alongside representative examples of objects which were in daily use. The book covers a vast range of object types – from the rare and the exotic to the everyday – offering a thorough coverage of the fascinating material which survives from this period. In addition to the outline history, the book features detailed descriptions of many important new finds which shed light into the gloomier corners of the period: the links between the Roman, Anglo-Saxon and Scandinavian worlds. British Artefacts is an ideal reference work for detectorists, archaeologists, museum staff, collectors and anyone with a serious interest in the early Anglo-Saxon years. The book contains 20 maps showing the distribution throughout Britain of various classes of objects and has over 230 beautiful illustrations. The contents show the breadth of coverage of the title: Intro to the Series, Glossary, Intro to the Early Anglo-Saxon Period, Advice for Collectors, Valuations, Runes, Advice for Finders, Outline of the Early Anglo-Saxon Period, Art styles, Artefacts production & distribution, Ceramic production and Metal Artefacts. The "Metal Artefacts" covered include: Brooches, Buckles & Belt Fittings, Clasps, Weapons & Fittings, Bowls & Vessels, Pendants, Belt Rings, Bracelets & Arm-rings, Chatelaines, Latch-lifters & Girdle-Hangers, Keys, Combs, Earrings, Finger-rings, Harness & Bridle Mounts, Neck-rings, Padlocks, Pins, Purse Mounts & Fire-steels, Pyxides, Spoons, Spurs, Tags, Metallic Threads, Toilet Sets, Tools and Weaving Equipment. The Non-Metallic Artefacts include Amber, Antler, Bone, Ceramics, Gemstones, Glassware, Horn, Ivory and Stone.